Browsing articles tagged with " procomp"
Transamerican Manufacturing Group (TMG) brands Pro Comp, Rubicon Express, Smittybilt, Trail Master, LRG Rims and G2 Axle & Gear were all featured in the TMG booth at SEMA 2014. Products like the G2 air locker and pneumatic sway bar disconnect and the Rubicon Express coilover conversion kit for JKs impressed aftermarket industry insiders at the Las Vegas show. The 47th annual SEMA Show happened November 4-7 with manufacturers showcasing the latest off-road truck and Jeep accessories. The TMG brands booth housed four builds – two Jeeps and two trucks. Parts included were a Long-Travel Suspension System and Series 41 Pro Comp wheels displayed on a 2014 Toyota Tundra Pro Runner truck. Smittybilt SRC bumpers with tire carrier and G2 lockers showed up on a 2011 Jeep JK Atlas. “The TMG booth at SEMA was a hive of activity and we had a lot of interest in new products,” says TMG Marketing Manager Chloe Eady. “Particularly, Pro Comp’s Long-Travel Suspension was well-received.” Eady added that a lot of the products at SEMA will be displayed and on competing vehicles at the 2015 King of the Hammers. Started in 1963, the SEMA (Specialty Equipment Market Association) Show is the top worldwide trade show for automotive specialty products. 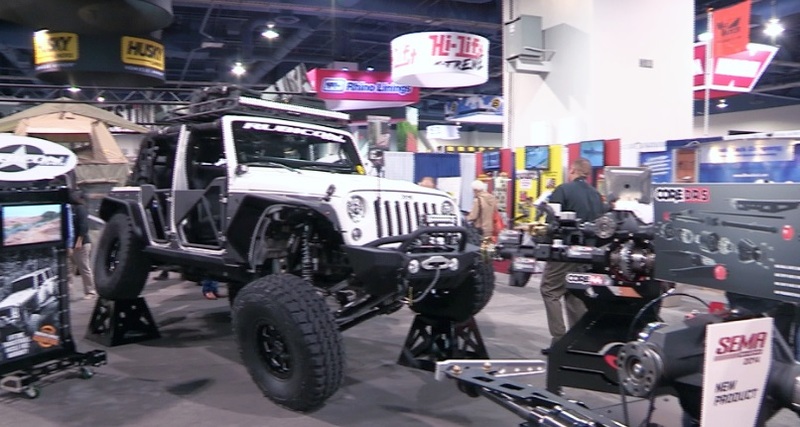 Industry insiders flock to Las Vegas, where vendors showcase their new products including 4×4 parts and accessories for off-roading.